The liberals who run the social media giants have openly discriminated against conservative publishers since the election of President Trump, as we were instrumental in his 2016 presidential election. Candidate Trump tweeted one of my articles to the world in February 2016. Facebook, Twitter, and Google are in an all-out war against conservative publishers, manipulating (restricting) our traffic, thus advertising revenue, which has dropped 98% in two years as a result, an effort by The Big Three to drive us out of business due to our support for President Trump. Liberal Democrats will not allow a second Trump term if they can prevent it and will go to any lengths to do that. My website, Powdered Wig Society (powderedwigsociety.com) is dedicated to the restoration of, and strict obedience to, the United States Constitution. I am an ex-Army officer and love my country deeply. Powdered Wig was started in 2013 as a protest to the anti-American actions of Barack Obama, and took off almost immediately, becoming a growing, self-sustaining operation within one year. Our weekly Facebook reach was as high as 15 million. As of October 1, 2018, our Facebook reach is 203,782, a drop of over 98%. We have nearly 300,000 Facebook followers, yet Facebook is preventing Powdered Wig's articles from reaching our followers. The social media giants are deliberately preventing the dissemination of conservative, patriotic content. We have been shadow-banned by Twitter, making us virtually invisible, and Google prevents our articles from being anywhere near the top of searches. Google has disallowed conservative publishers the use of its advertising platform Adsense, which was once our top advertising revenue producer. Now, our Adsense revenue is $0. UPDATE: Powdered Wig was among the conservative pages shut down by Facebook in the "Big Purge" on October 11, 2018. 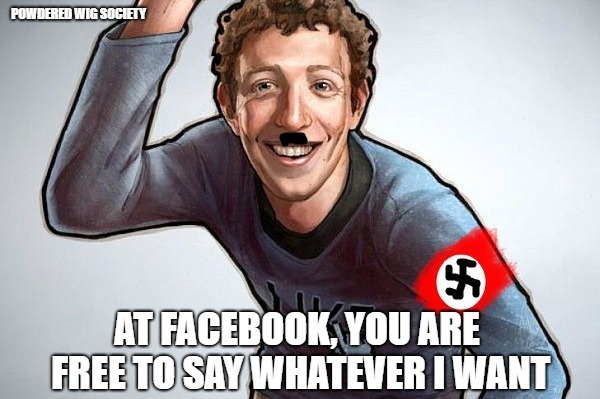 There is no such thing as free speech at Orwellian Facebook. This is anti-conservative hatred in a most wicked and unAmerican form. If this egregious discrimination is allowed, then we have no First Amendment. President Trump and Congress are aware of Fascistbook's bias against conservative publishers and I believe will address it in a meaningful way at some point over the next two years or possibly into the next administration. Until then, we desperately need help. We are trying to raise $150,000 for legal expenses to sue Facebook and to keep the lights on at Powdered Wig and the message alive over the next two years. Anything we can raise in addition to that will go toward future operations beyond 2020 or until Washington finally tames the belligerent social media giants which are openly violating the First Amendment rights of conservative publishers. Please help if you can. Anything will help. No amount is too small. If you can't help with a donation, then please share our GoFundMe link ( https://www.gofundme.com/powdered-wig-society) on your social media pages. Thank you in advance for anything you can do to help. My gratitude is boundless. And, by all means, check out our website, powderedwigsociety.com and visit us on Twitter. Together, there is no question, we will make America great again. If you care about free speech, please help us fight facebook which is silencing conservatives. Help us fight for the First Amendment. Please help us fight Facebook. And please, share the link to this page everywhere you can to help us publicize it. Thank you! Please share our GoFundMe campaign with everyone you know.